The UK government is to introduce a new ‘no-fault’ divorce. The new law, which will apply to marriages and civil Read more. Parental Responsibility Parental Responsibility is derived from the Children’s Act 1989. It refers to: “all the rights, duties, powers, responsibilities Read more. “I’m divorced, so Sikh men don’t want me” Minreet Kaur is a henna artist and a freelance journalist who works Read more. The SKB Law Academy We’re thrilled to launch the SKB Law Academy – our exciting new leadership platform for future Read more. We’ve got some exciting news! From March 2019, the firm’s name will change from Shire Solicitors to SKB Law. It’s Read more. 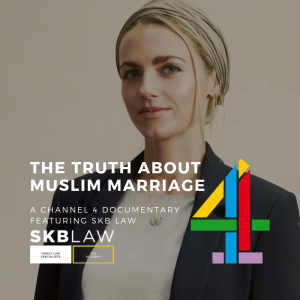 Many Muslim women in Britain are unaware that their marriages aren’t legally recognised. Our Managing Partner, Sarah Khan-Bashir MBE explains Read more. It can be difficult to understand what to do next when you’ve reached the decision to divorce. Our step by step Read more. SKB Law Academy partners with Yorkshire Building Society to equip students with employability skills. The below article originally appeared in the Read more. Your handy guide to changing your name – adults and children. How long does it take for a Change of Name Read more. Since the referendum, there has been confusion about the rights of EU Nationals in the UK. EU Nationals become an Read more. SKBLAW is a trading style of Shire Solicitors which is registered in England & Wales with the registered office address: 7 Eldon Place, Bradford. BD1 3AZ. SKBLAW is Authorised and Regulated by the Solicitors Regulatory Authority in England and Wales with Registration No: 638301.